The Mayflower PWCC will be following the AKC guidelines for preventing the spread of contagious disease at our Specialty. The Boxborough Regency has not hosted a dog show for the last two months so there in no chance of site contamination from other events. Each exhibitor has received a statement from the AKC regarding Canine influenza along with their entry and Judging Program. There have been no confirmed cases of Canine influenza in the northeast. ​Plans are well underway for our 27th Specialty! Here's some information to get you ready! As always, we will be having a raffle and a silent auction! 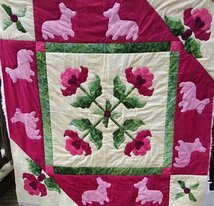 - Again this year, we are raffling off another beautiful quilt sewn by our very own Barb Fisher, in addition to other great items! - Please visit our Ways and Means table for wonderful Corgi and Mayflower themed merchandise. - We'll also have vendors lining our banquet hall. Make sure to visit their booths! See below for our Schedule of Events. Links to entry forms and premiums are also here! Mayflower Pembroke Welsh Corgi Club Agility Trials. Secretary - Noreen Bennett, www.pawprinttrials.com for entry information. Mayflower Pembroke Welsh Corgi Club Agility Trials, Corgi Only. Junior Showmanship ~ Judge: Dr. Donald Sturz, Jr.
Conformation ~ Judge: Dr. Donald Sturz, Jr.
2017 Herding Instinct Test Premium here. Celebrating 5 years of the Versatility Challenge! Special memento for any one who has participated all 5 years. The 2017 Specialty is being held at the same hotel as in previous years (Holiday Inn), which has been renamed to the Boxboro Regency. Click here to view and print the room reservation form. PLEASE DO NOT ​USE THE FILES BELOW FOR THE 2017 SPECIALTY. They will be removed from this site soon. Sorry for any confusion! FOR THOSE THINKING OF ENTERING RALLY AND THE HERDING INSTINCT PLEASE JUST NOTE IT ON YOUR ENTRY OR EMAIL RAU SO THEY CAN SCHEDULE IT OUT. RALLY TAKES PRECEDENCE. ​We're trying a new system for volunteering at the Specialty this year; instead of just signing up for a job, try signing up for a time slot. Please visit the Google Doc to signup to help. Every bit of help is greatly appreciated. 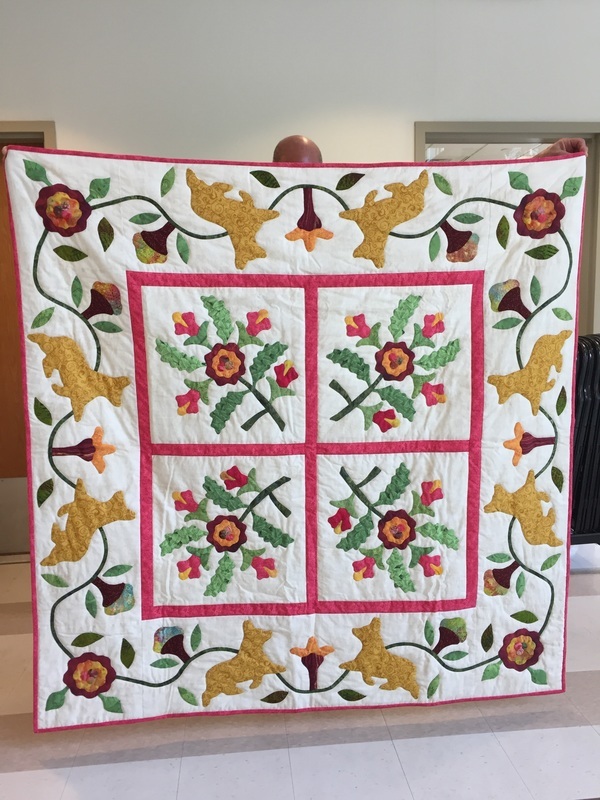 BARB FISHER HAS COMPLETED THE 2016 QUILT FOR RAFFLE, AND IT IS BEAUTIFUL! BUY TICKETS FOR THE JUNE RAFFLE FOR YOUR CHANCE TO BRING THIS BEAUTY HOME! Concession space is limited. If you are interested in being a vendor, contact Linda Thompson at lyonhill@lyonhill.cnc.net or (413)354-9636. You must return our contract, and complete the Transient Vendor License with the Town of Boxborough found at the link below to vend. Two Specialties for This Year Only! Get Your Tickets Early! RSVP to attend - Open to All! Only the official photographer may take win pictures in the ring or photo room. Group Rate is available by stating you are with the "Mayflower Pembroke Corgi Group"
Room Rates are $120.00 for Single or Double occupancy $130.00 for Triple/ $140.00 for Quad. This is a "Block Rate" and applies only to reservations made before May 22. Make reservations directly with Holiday Inn, (978-263-8701) and mention Mayflower Pembroke Welsh Corgi Club. Check-in time is 3:00 P.M.; Check-out time is 12:00 PM. First floor rooms are being assigned by the Mayflower Club to accommodate those with young puppies or with other special circumstances. E-mail Dolores Bechard. A one time $25.00 non refundable cleaning fee will be required for each guest room that will house dogs. A valid credit card is required at check in to be used for a damage deposit. Guests paying cash must pay an additional $100 damage deposit per owner. The hotel reserves the right to charge a guest for excessive damages by a dog in the room. ● Unattended dogs in rooms must be crated. Plastic is required under crates and will be provided by the hotel. ● All dogs must be on leash on hotel grounds except when in the ring. ● No bathing or grooming dogs in rooms. Use the club bathing room and grooming area near the exhibit hall. Bring your own towels. If there is evidence that dogs have been bathed in the rooms you will forfeit the $100 deposit. ● No dogs in restaurants or eating areas. ● Walk dogs in designated areas only. CLEAN UP AFTER YOUR DOG, PLEASE. ● RV overnight parking at the hotel is $35 per night. Use reservation form in premium list. Send directly to hotel. No hookups or dumping at hotel. Contact nearby campgrounds. ● Day RV parking in designated parking areas only. From the West - Take Route 290 to Exit 26B (Rte 495 NORTH) toward Lowell. Take exit 28, Rte 111 East Boxborough. Turn left onto 111, turn right onto Adams Place. From the South - Take 495 North and follow as above. From the East - Take Rte 3 North, to exit 32A toward Lowell. Take Rte 495 Exit, South and follow to Exit 28, Rte 111 Boxborough. Turn right onto Adams Place. 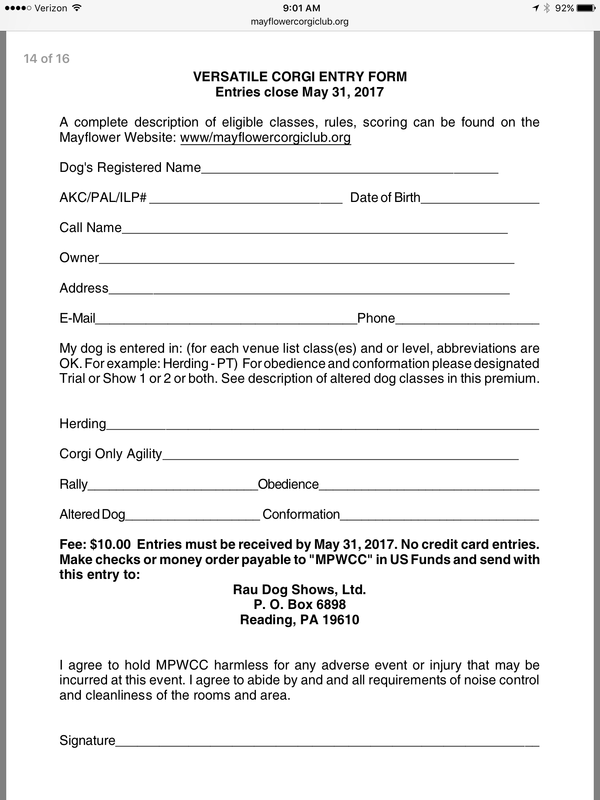 Separate entry forms must be submitted for each dog in Brace, Rally Pairs, and Rally Team. However there is only one entry fee per unit. All entry forms for these classes should be submitted together. ​The famous Mayflower Silent Auction will be held Friday night. Donations are appreciated. Karen Gunzel is Chairman, with Linda Thompson & Paul Cope assisting. Reserved Grooming Space per space which will hold a table and two crates. If you want to groom with friends, get together with them, request # of spaces on one RSVP under one name. This will guarantee you will groom together. 1-3 Spaces are $20 per space. 4 or more spaces are $17 per space. See RSVP page for reservations and payment information. Contact Mary DeToma for particular space and placement (such as handicapped) requests at winddancercorgis@yahoo.com. WELCOME PARTY! Come to the Cabaret! Wed. June 15, 2016. Come celebrate and meet old and new friends. Watch the Altered Dog and Veteran Sweepstakes Classes. Join us for a cash bar and casual dinner. The charge is $20 for dinner, but entry to the party is free. Please make your food reservation using the RSVP form by June 1, 2016. Come join us for a buffet dinner and an evening with friends after the membership meeting. Please make your food reservation using the RSVP form by June 1, 2016. Friday, June 17th. Cash Bar, one hour before dinner. Cost: $40.00 per person. Dinner will be a buffet dinner. Vegetarian and gluten-free meals will be available upon request. Note: reservations for the dinner must be made in advance. It will not be possible to make a reservation during the Specialty. Your Dinner reservation is non-refundable. Please make your food reservation using the RSVP form by June 1, 2016.
www.louisamayalcott.org, to learn about Louisa May Alcott and her bohemian family. www.fruitlands.org. Tour the site where the Alcott Family spent seven months of communal living in 1843. The view alone is worth the trip! You could also separate these two excursions into two separate trips. There are lots to do and see.